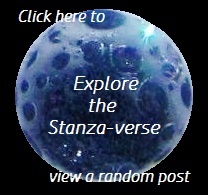 Inward Eyes | What Rhymes with Stanza? the power of seeing; appreciative or discriminating visual perception: [as in] the eye of an artist. Okay, so this particular definition is sixth in line of the listed meanings, but it is there. I think for most visual artists, what you see (literally, with your eyes) when you look at their work is inconsequential compared to what you feel. Or how it makes you think. Or what memories it evokes. Or any number of other responses. But a response that comes from your inner eye. I always find it interesting to hear how my stained glass pieces affect a viewer. What it says to them, if anything. It’s especially interesting with my abstract designs. Someone saw one of my panels once and said, “That looks like hope!” Someone else might see it and say it looks like despair. There’s no right or wrong. I may have my own interpretations of the pieces, and my interpretation is also neither right nor wrong, even though it’s my creation. It can evoke myriad responses from me, too. Different responses at different times. Different things that my inner eye chooses to perceive. That’s what makes art – and life – interesting. This entry was posted in Art as Art, creativity, weekly photo challenge and tagged art, meaning of art, moon, Rumi, stained glass, weekly photo challenge. Bookmark the permalink. The moon phases image really got me thinking – great how the prompt can do that! Yes, it is great! Glad you found some inspiration.